Texans like their ribs served "dry" rather than "wet" like they do in places like Memphis and Kansas City. If you want to baste the ribs while they cook, you can prepare the Basic Beer Mop and put it on about every hour. 3 full racks of "St. Louis" style ribs, about 3 pounds each. The ribs should be trimmed of the chine bone and brisket flap. Starting the night before, combine the rub ingredients in a small bowl. Apply 1/2 the rub evenly onto the ribs. Make sure you reserve about half the rub. Place the ribs into a plastic bag and refrigerate overnight. 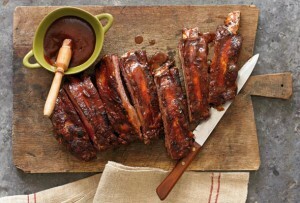 Take the ribs out of the refrigerator and let them sit about 45 minutes. 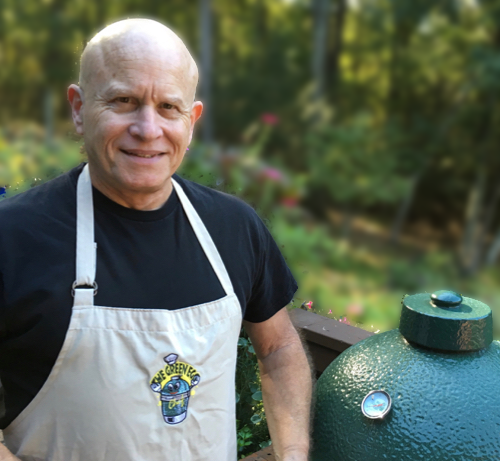 Start your charcoal while the ribs sit and bring the temperature to between 200° and 225°. If you are going to use the Beer Mop, mix together the beer, vinegar, water, oil, onion, garlic, Worcestershire sauce, and rub in a large saucepan. Warm the mop liquid over low heat. The ribs will be ready to eat when you see the bones and you can begin to crack them apart with a gloved hand. Allow the ribs to sit for 10 minutes and then slice them into individual ribs. Personally, I don't mop during the cook because the Egg doesn't dry out the ribs like other smokers—you can, if you want, just apply the mop about 15 minutes before you pull the ribs to put a sheen on them.